At NOFA-VT, we’ve been working with food service giant Sodexo for four years now during the Winter Conference at UVM, and we’ve seen their capacity for and commitment to using local foods improve each year. 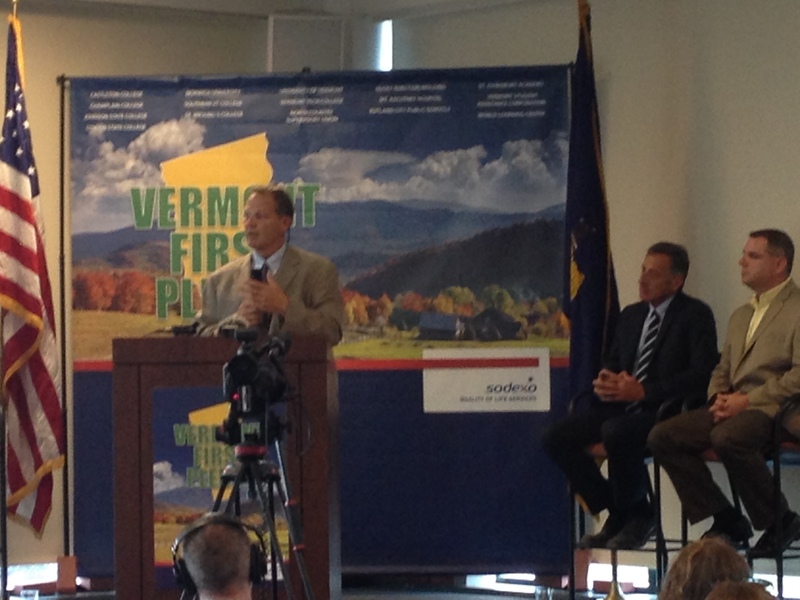 We’re glad to see the change formalized in the company’s new “Vermont First” campaign. VT Secretary of Agriculture Chuck Ross applauded Sodexo’s move during a press conference on September 4. Photo by Abbie Nelson, NOFA-VT.
Sodexo is undeniably a multi-national corporation, and the move is certainly based off of market pressure rather than pure goodwill. Rather than seeing that as cause for suspicion, however, it can be considered a victory: Vermont’s support of and demand for local foods is strong enough to sway the purchasing decisions of a company that operates in 90 countries. 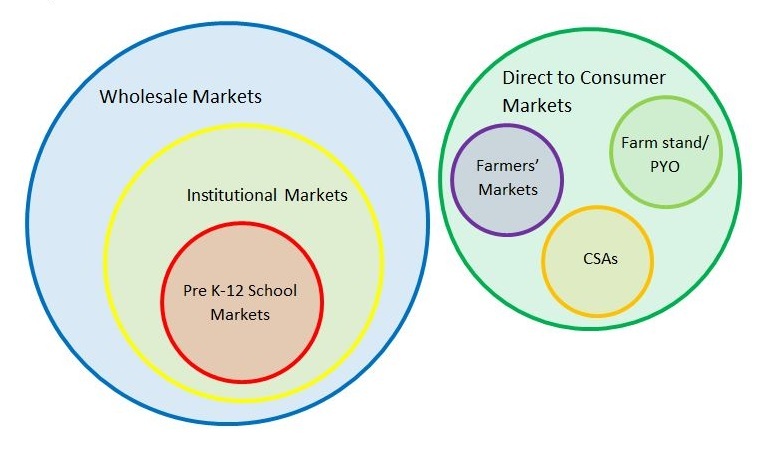 And while many Vermont producers do not currently operate at the scale Sodexo requires, an increase in institutional purchasing such as that done by Sodexo represents an opportunity for growth in a state already hip-deep in farmers’ markets and CSAs. New farmers or farmer cooperatives may be able to succeed in areas that otherwise would be saturated or, alternatively, may lack the population to support them through traditional direct marketing means. Additionally, institutional purchasing makes local food immediately available to more people, including those who may not be otherwise engaged in the local foods movement. It remains to be seen how much Sodexo will dedicate to the change — according to VTDigger, no official benchmarks have been set, though the company has hired a local foods coordinator. We hope to see real increases in local purchasing, which could fuel both the local and regional food economy. Even an incremental change in Sodexo’s Vermont purchasing habits will show up on 34,000 plates each day. That represents a great opportunity for farmers and consumers alike, as well as a potential model for other institutional buyers. Farmers interested in selling to institutional markets are encouraged to fill out the Wholesale and Institutional Markets Survey, and to contact NOFA-VT if you would like technical assistance in business planning, creating contracts, or production. While visiting school kitchens around the state, representatives from the School Nutrition Association of Vermont (SNA-VT) and Vermont Food Education Every Day (VT FEED, a program of NOFA-VT and Shelburne Farms) took note of the delicious offerings being served to Vermont schoolchildren by talented school nutrition professionals. How could they share these ideas, techniques, and recipes with other school food service? 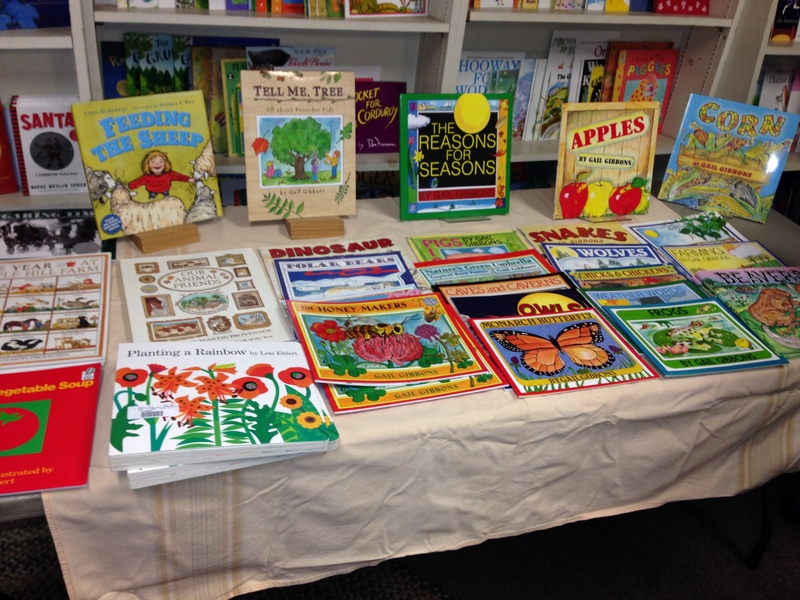 New School Cuisine: Nutritious and Seasonal Recipes for School Cooks by School Cooks is the result of their wondering, fundraising, and collaborating. 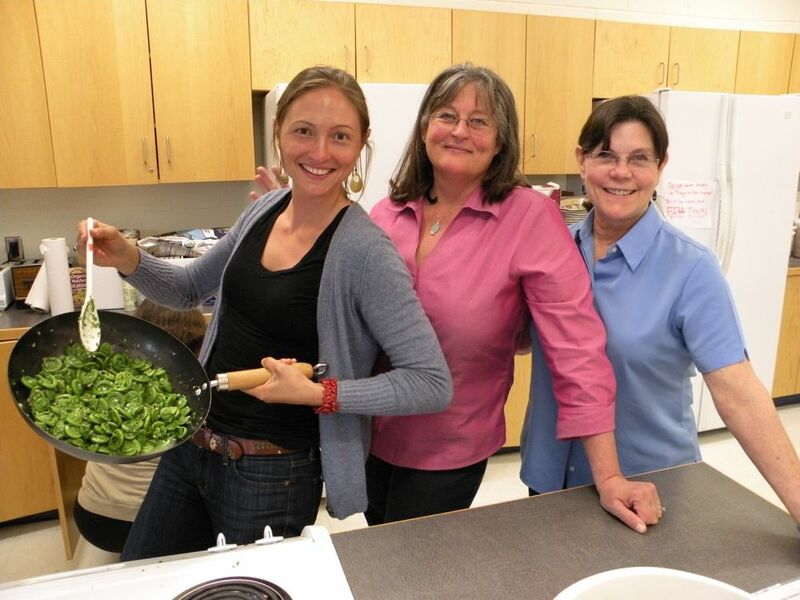 With support from a USDA Team Nutrition grant, SNA-VT and VT FEED together with the Vermont Agency of Education began a year-long culinary adventure. Fourteen school chefs were invited to submit innovative cafeteria creations and worked closely with professional recipe developers and testers to learn how to modify and standardize their recipes. Each recipe underwent thorough testing—by the school chefs in their own cafeterias and students at the New England Culinary Institute. Called “groundbreaking” by Ann Cooper, a powerful voice for school food reform, New School Cuisine is the only cookbook created by school nutrition professionals that meets the 2012 USDA guidelines, is kid-tested, and features farm-fresh, local, seasonal ingredients. 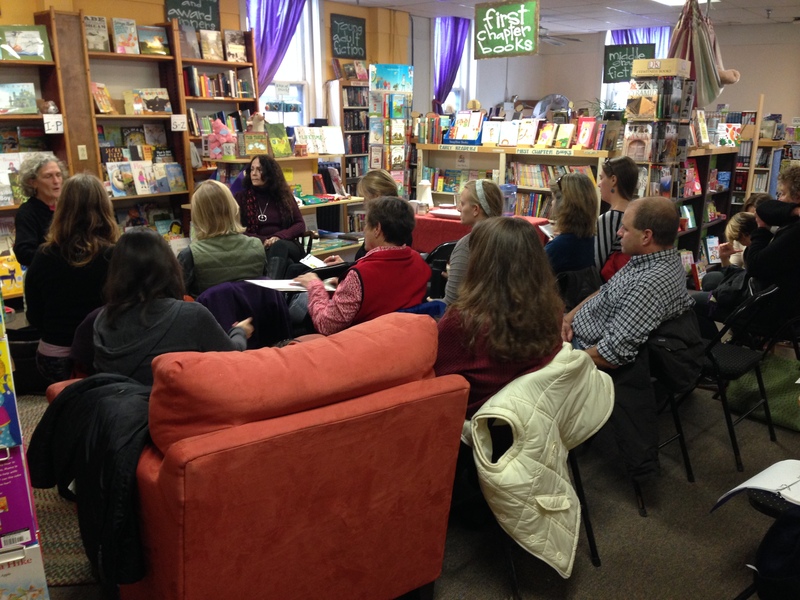 The cookbook, available as a free download from VT FEED and for purchase through the Shelburne Farms online store, is being put to use in schools across the country, at last count in 25 states. 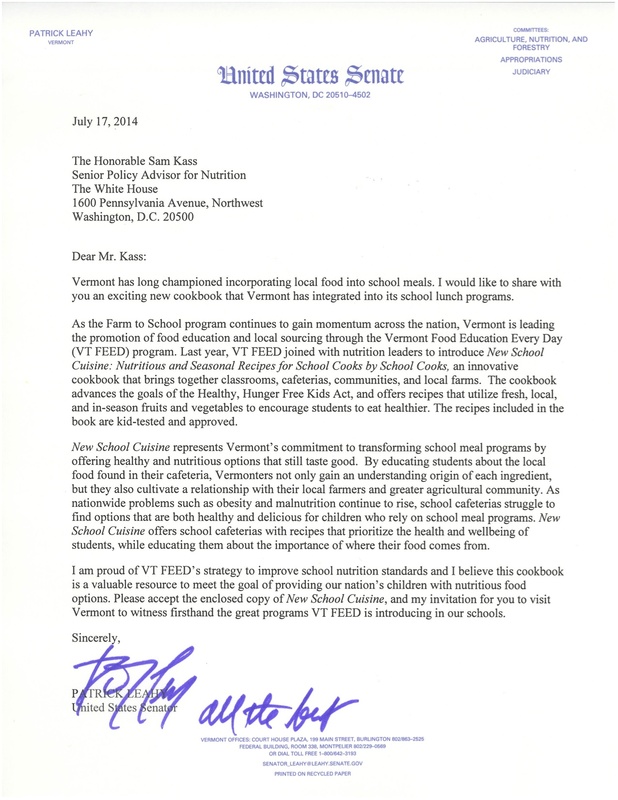 By sharing this first-of-its-kind resource with the White House Senator Leahy is providing Mr. Kass and First Lady Michelle Obama with a powerful tool they can use to advance their mission of changing the way we feed children across the country. We hope they will come to regard it as a valuable resource in their work toward improving the health of our nation’s youth.